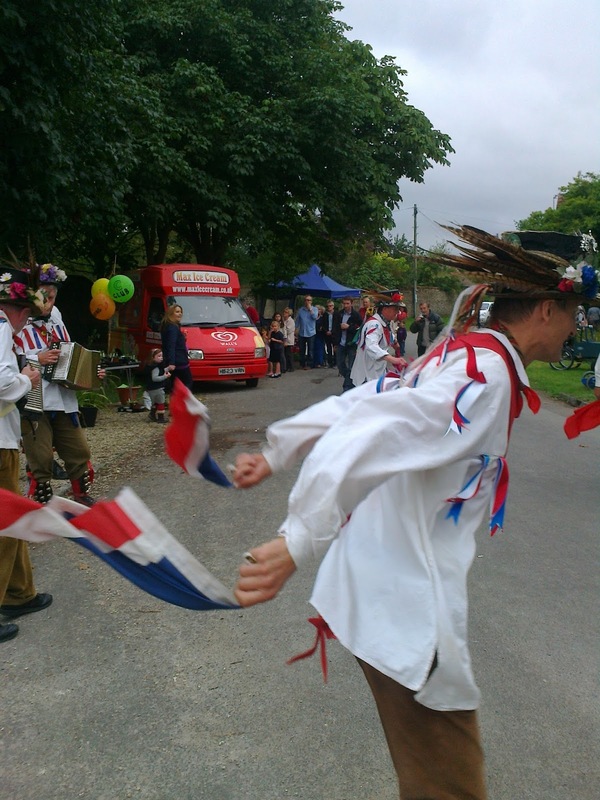 Last autumn, the Morris men came to dance at our village’s annual Michaelmas Fair. 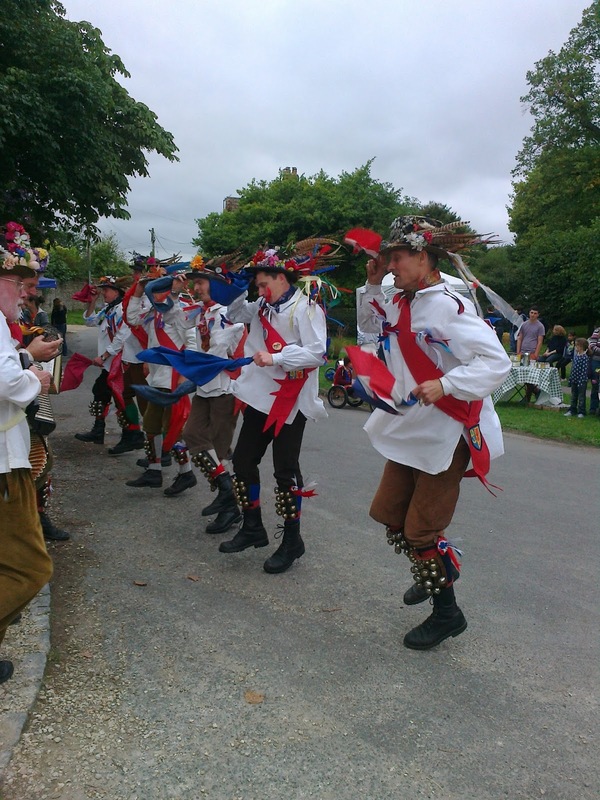 Oxfordshire is famed for its Morris dancers; only a few miles north of here is the village of Bampton, home of the three Bampton Morris teams which claim an ancestry of at least 400 years. Nobody knows quite how far they go back, but it appears that the name ‘Morris dance’ really means ‘Moorish dance’ and is derived from the Spanish ‘morisca’, a 15th century European dance in which the participants mimed a sword-fight between Christians and Muslims. This rather suggests the themes of many of the mumming plays still popular in England, in which Saint George or King Alfred or Lord Nelson or some other English hero fights and eventually slays (after a great deal of burlesque comedy) a ‘Turkish Champion’. (In one of last year’s local mumming plays, the part of the Turkish Champion was gallantly undertaken by a Turkish national who happened to be living in the area.) 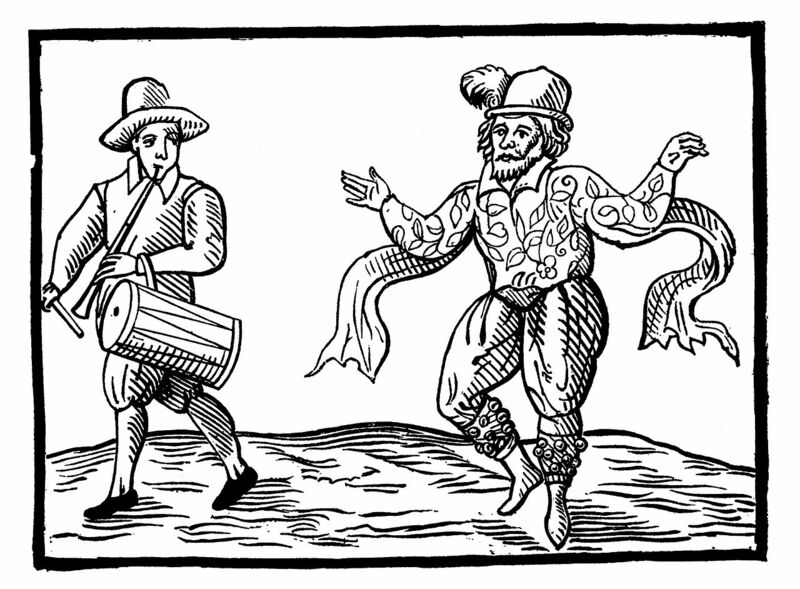 Even today Morris dances and mumming plays are often performed by the same sets of people: and the plays often end with a jig. This one took place outside a local pub on New Year's Day. You can see the beautiful Princess making a speech! 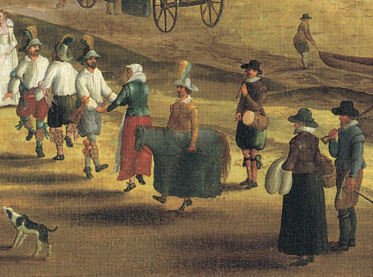 Here one fellow with a horse’s head painted before him, and a tail behind, and the whole covered with a long foot-cloth, which was supposed to hide the body of the animal, ambled, caracoled, pranced and plunged as he performed the celebrated part of the hobby-horse … another personage in the formidable character of a huge dragon, with gilded wings, open jaws, and a scarlet tongue … made various attempts to overcome and devour a lad dressed as the lovely Sabaea, daughter of the King of Egypt, while a martial Saint George, grotesquely armed … ever and anon interfered and compelled the monster to relinquish his prey. … There was a group of outlaws, with Robin Hood and Little John at their head … Men were dressed as women and women as men. In the old days, Morris tunes were played on pipe and tabor (a small drum), but are now usually played on fiddles and accordions – and an essential part of the costume are the sets of bells strapped around the dancers’ shins, that jingle as they move. Ver goes in and fetcheth out the hobby-horse and the morris-dance, who dance about. Ver: About, about, lively! Put your horse to it, rein him harder, jerk him with your wand! Sit fast, sit fast, man! Fool, hold up your ladle there! Will Summers: … Now for the credit of Worcestershire! The finest set of morris-dancers that is between this and Streatham. Marry, methinks there is one of them that danceth like a clothier’s horse, with a woolpack on this back. You, my friend, with the hobby-horse, go not too fast, for fear of wearing out my lord’s tile-stones with your hob-nails. Hamlet: …What should a man do but be merry? For look you how cheerfully my mother looks, and my father died within’s two hours. Ophelia: Nay, tis twice two months, my lord. 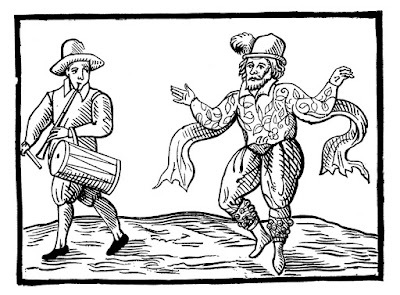 Hobby-horses and Morris-dancing are also linked in ‘Kempe’s Nine Daies Wonder’, the lively personal account of the comic actor and dancer Will Kempe, late of Shakespeare’s company, the Lord Chamberlain’s Men, who set off in February 1600 to Morris-dance his way from London to Norwich. This distance of more than a hundred miles, he undertook to complete in ten days – not counting rest days in between. (He accomplished it in nine.) For the towns and villages through which he passed, this was a real occasion: Kempe was (in modern terms) a celebrity. People turned out in hundreds and even thousands to watch him come dancing by – rather as people turned out all over Northern England to welcome and cheer the cyclists of the 2014 Tour de France. It was, as much as anything, a fabulous publicity stunt: Kempe needed a gimmick, having quitted the Lord Chamberlain’s Men in 1599 after what may have been a disagreement with Shakespeare. At least, if in 1602 Hamlet’s words to the players were written with Kemp in mind, it’s possible he’d been fooling around getting laughs at the expense of other actors, and spoiling the performance. And let those that play your clowns speak no more than is set down for them; for there be of them that will themselves laugh to set on some quantity of barren spectators to laugh too, though in the meantime some necessary question of the play be then to be considered. That’s villainous, and shows a most pitiful ambition in the fool that uses it. Kempe not only had the comedian’s popular touch, he was clearly a considerable athlete with stamina, detemination and the ability to make himself liked. Here he is on the fourth day of his venture, as he dances between Chelmsford and Braintree – through thick mud. although the way were rotten. This foule way I could find no ease in, thicke woods being on eyther side the lane: the lane likewise being full of deep holes, sometimes I skipt up to the waist: but it is an olde Proverbe, That it is a little comfort to the miserable to have companions, and amidst this miry way, I had some mirth by an unlookt for accident. One a fine light fellow would be still before me, the other ever at my heels. At length coming to a broad plash of water and mud, which could not be avoided, I fetcht a rise [ie: made a leap], yet fell in over the ankles at the further end. My youth that followed me, took his jump, and stuck fast in the midst, crying out to his companion, ‘come George, call ye this dancing, Ile goe no further,’ till his fellow was fain to wade and help him out. I could not chuse but laugh to see how like two frogges they laboured: a harty farewell I gave them, and they faintly bad God speed me, saying if I danced that durtie way this seven years again, they would never dance after me. … there came a lusty tall fellow, a butcher by his profession, that would in a Morrice keepe me company to Bury: I being glad of his friendly offer, gave him thankes, and forward wee did set: but ere ever wee had measur’d halfe a mile of our way, he gave over in a plain [ie: open] field, protesting, that if he might get a 100 pound, he would not hold out with me; for indeed my pace in dauncing is not ordinary. And now comes one of the most famous passages of all! As hee and I were parting, a lusty Country lasse being among the people, called him faint-hearted lout: saying, ‘if I had begun to daunce, I would have held out one mile though it had cost my life.’ At which wordes many laughed. ‘Nay,’ saith she, ‘if the Dauncer will lend me a leash of his bells, I’ll venture to treade one mile with him myself.’ I lookt upon her, saw mirth in her eyes, heard boldness in her words, and beheld her ready to tuck up her russet petticoat; I fitted her with bells: which she merrily taking, garnish’d her thicke short legs, and with a smooth brow bade the Tabourer begin. The Drum struck, forward marched I with my merry Mayde Marian: who shook her fat sides and footed it merrily to Melford, being a long mile. There parting with her I gave her (besides her skinful of drink) an English crown to buy more drink, for good wench she was in a pittious heate: my kindness she requited with dropping some dozen of short courtsies, and bidding ‘God blesse the Dauncer,’ I bad her adiue: and to give her her due, she had a good ear, daunced trulie, and wee parted friendly. But ere I part with her, a good fellow my friend, having write an odd Rime of her, I will make bold to set it downe. Was Marian in his Morrice daunce. Were replete with mirthful laughter. Kindly paid and well commended. from London Bridge on 23rd April and danced his way through Essex and Suffolk before arriving in Norwich on the 6th of May: "He completed the trip despite being stopped by police, and enduring pain from stinging nettles and blisters." Starting much later in the year than Kempe, he did the trip in fewer days - though probably on much better, if harder, roads. "I met loads of people," he said, "and that became the story, really." I'm sure Will Kempe would agree. 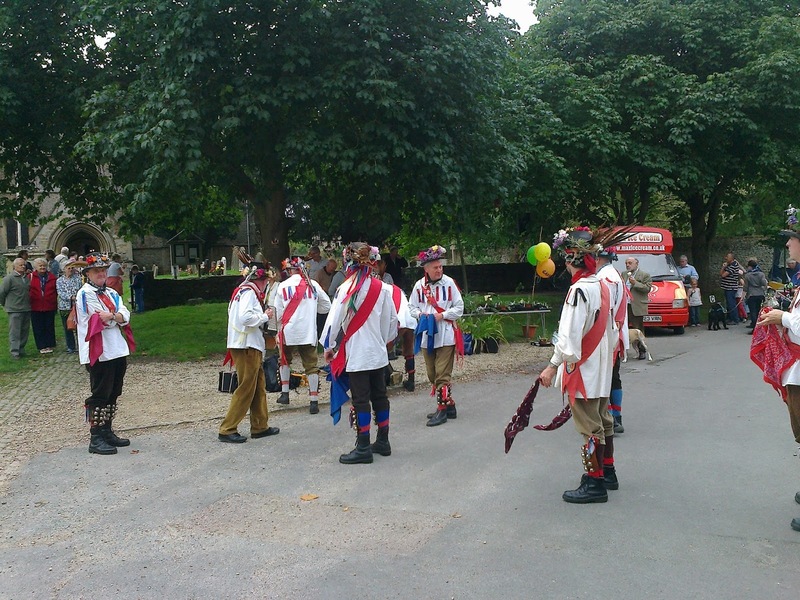 video: The Bampton Morris Men, youtube. What a wonderful tradition! I see there's a child among the dancers in that video.... Nice! Lovely post. I know many people snigger at Morris Dancing but not me. I love these old traditions and long may they continue. Brings back happy memories! I've danced with several morris sides, both the Cotswold tradition (Bath City) and north west clog (Severn Gilders, who dance with a border team called the Ironmen). I don't dance with a team these days, but can still play some of the old tunes on my melodeon. PS. 'Gilders' is not a typo - the team was named after the women who gilded the pottery in their local area. Came rather late to this but thanks for this post Kath - as fascinating and wide ranging as ever! 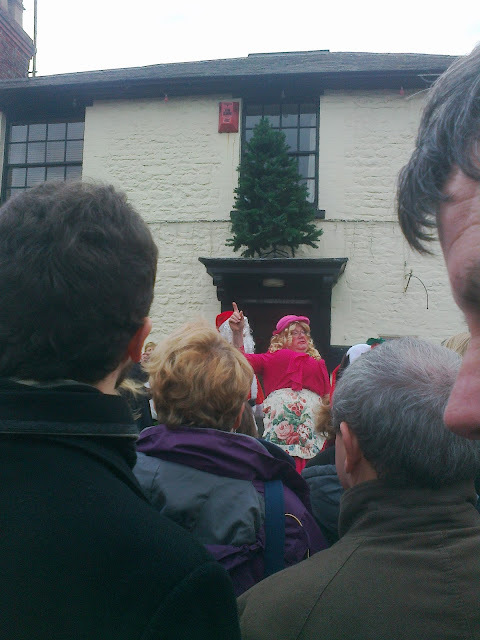 I love Morris Dancers of all stripes but especially the black face sides. Despite all those cliches about effete handkerchief waving, they bring a real connection to the rural (and urban) past. 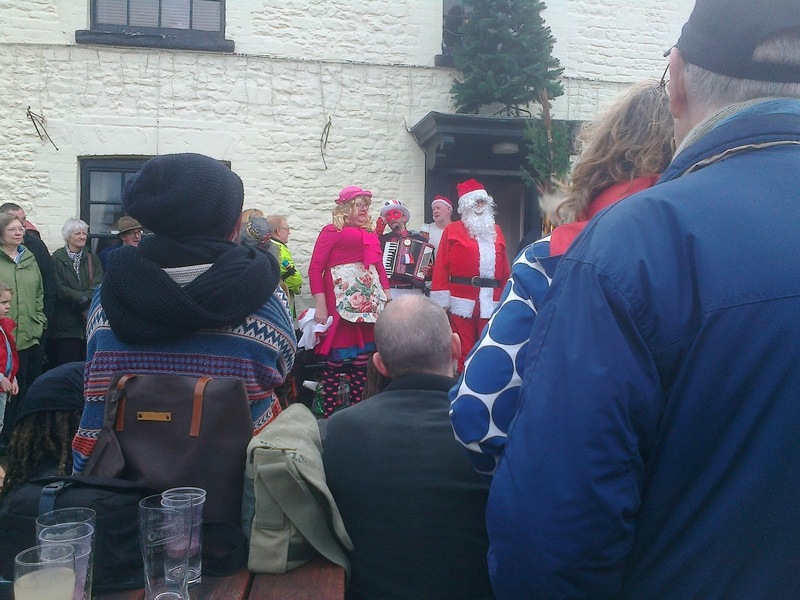 I made sure to have Morris dancers in The Fool's Girl. I don't believe all that stuff about them really being a Victorian invention. Yet another attempt to take all the fun out of history.